Remember, the Bible said, "You are living, written epistles, read of all man." Now, many people won't read the Bible, but God has made you a living representative. 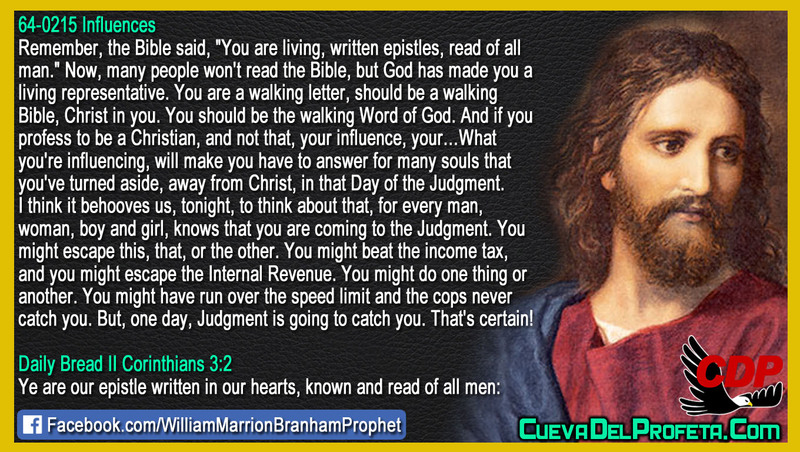 You are a walking letter, should be a walking Bible, Christ in you. You should be the walking Word of God. And if you profess to be a Christian, and not that, your influence, your…What you're influencing, will make you have to answer for many souls that you've turned aside, away from Christ, in that Day of the Judgment. I think it behooves us, tonight, to think about that, for every man, woman, boy and girl, knows that you are coming to the Judgment. You might escape this, that, or the other. You might beat the income tax, and you might escape the Internal Revenue. You might do one thing or another. You might have run over the speed limit and the cops never catch you. But, one day, Judgment is going to catch you. That's certain!